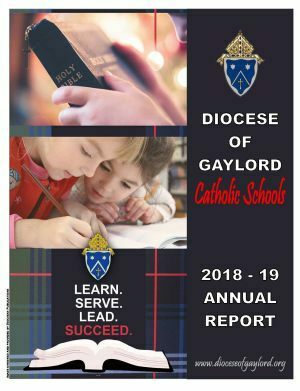 As a service to our Diocesan parishes and schools, the Diocese of Gaylord Office of Catholic Schools has published an Annual Report on the status of the Catholic schools in Northern Michigan, which is available by clicking on the link below. This report gives an overview of our schools, where they are located, what the schools are accomplishing, and provides answers to questions interested stakeholders may have. As you read this information over, if you are curious about visiting one of our outstanding schools, please feel free to contact our office and we would be happy to help you set up a visit.